When TechyDad and I were newlyweds, we went out to the store and bought a bunch of board games. We both loved word games, trivia, and things that would challenge our brains. We used to play the games on Shabbat or when we had friends over. It was a great time without television and computers. Flash forward to life as the parents of two little boys. When we play board games, they tend to be for the kids. The games that we have for us from before are still packed away in an undisclosed location within the house. When I was recently asked by Family Review Network to try out a game called Rummino by Marina Games, I was excited. This was the perfect opportunity for TechyDad and I to test out the new game together. You know, actually pry ourselves away from the computers/blogging and play a game just the two of us. Rummino is a whole new way to play Rummy! Combining the game play of Rummy with the strategy of word tile games, Rummino is a one of a kind master strategy game for the whole family. The object is to get the highest score at the end of the game. Each player draws 7 tiles and plays them off the sets and runs already on the table. Earn points for every tile you ‘add-on’ to a run or set. Get a two way run and earn extra points. Finish off a run or set and double or triple your points for that play. 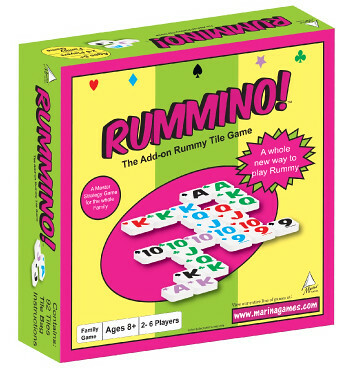 The perfect game for family game night, Rummino is easy to learn and fun for the whole family to play! With its ease of learning combined with the strategy involved, this game keeps everyone entertained from the 8 year old learning to play games to the skilled adults desiring a challenge. Watch your opponents moan and groan as you use one tile to score 36 points! TechyDad read the directions for Rummino and then we sat down to try it out. After we started our first game, we quickly realized we were not playing right. Of course, that was the "Ah-ha" moment! Suddenly everything clicked and we realized that we were making too much of the directions. We put all of the tiles back and started again. This time, we were a bit more competitive. We knew what we were doing and sat there trying to use major strategy to rack up our points. The game lasted for quite some time, but it was a lot of fun. Both TechyDad and I commented today that if we do indeed get rid of our cable television we will have more time to play Rummino and our other cleverly hidden games from the past. We both really enjoyed Rummino and can not wait for a chance to play again. As we played, we wished that Rummino had come with something to put the tiles on (like in Scrabble). It would have been a lot easier to hide from each other while still being able to see them to strategize. As I mentioned, we had to regroup after an "ooops" with the directions. TechyDad and I were talking about it and we think they may have been a bit too lengthy, thus complicating them. Of course, once we had our "Ah-ha" moment we were good to go and ready to compete. Both of us also agree that we are going to try to have our six year old son try to play next time. We think that with a little coaching/modeling of play he will catch on quickly and enjoy this. Of course, we will still have our adult mind tournaments where we battle for supremacy! Thanks to Marina Games, one lucky reader will be able to win their own Rummino to play with family and friends. MAIN RULE – Answer the following question: What other game from Marina Games would you love to try? Head over to their website here to check out their other games. 1 Bonus Entry – Let me know who you would love to play Rummino with. 1 Bonus Entry – This is my 1000th blog post. Look around and leave me a comment on another post. Be sure to let me know here where you were. To enter, please follow the rules above within the comment section. Contest starts today October 18th and ends at 10:59 EST on November 1, 2009. You do not have to be a blogger to enter, but must leave a valid e-mail address for me to contact you for mailing address once the giveaway is over. I will select the winner using random.org and contact you via e-mail. You will have 48 hours to claim the prize. If there is no response, another winner will be selected. Open to U.S. residents only. Disclosure: This post was written as part of a program for Family Review Network and Marina Games. I received a free copy of the game to facilitate my candid review. The opinions expressed are my own. .-= tina reynolds´s last blog ..Boiron Homeopathic Children’s Products =-. Thank you to everyone that entered the Rummino giveaway. A winner has been selected and will be notified by e-mail soon. That person had 48 hours to reply or another winner will be selected.